You may search our website! Click the "Search the Western Clippings Site" line below which will bring up a Google box. Type whatever you're looking for in that box and Google will show you where to find it on our site. It's best if looking for a multi- word item (such as Bill Elliott) to put it in quotes ("Bill Elliott"). If your page doesn't open up or says, "not found", go back and try clicking on the word "Cached" on the Google listing. We have recently posted hundreds of B-Western and TV star autographs for sale...along with a few silent actors. Go to Miscellaneous Collectibles and then Autographs. Just a heads-up to let you know as of March 17 new columns have been added to An Interview With..., Will “Sugarfoot” Hutchins, The Heavies, Westerns of…, Serial Report and Rangeland Elegance. Additional columns are added monthly. There’s also a new Western Treasures page, Gallery 111. We're continually adding more collectible items to this site. Please visit us often. If you are looking for something particular and you don't see it here as of yet, please email or call. "Circus Cowboys" is a new category we've just added to our "Articles" section. Scroll down on the left for all the circus history of Tom Mix, Ken Maynard, Hoot Gibson, Jack Hoxie, Buck Jones, Tim McCoy and many more. For current subscribers of our magazine, this website in no way changes our print edition six times a year. This website will be a constantly updated, evolving site, with new articles, reviews and sales items added continually. 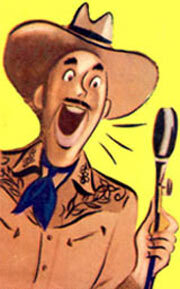 Look for new articles and photos in the “Do You Remember…”, “Comic Book Cowboys”, “Will Hutchins—A Touch of Hutch”, “Serial Report”, “Characters and Heavies”, “An Interview With…”, “Best and Worst of the Silent Westerns”, “Western Treasures” and “Film Festival Fotos” sections to be added regularly, with already posted articles always available in our archives for each section. Sales material—original movie posters (western and non-western), lobby cards, and much more will all be available for purchase as well as superb high quality laser copies made from our extensive collection of over 5,000 western lobby cards. We’ll also have thousands of toys, books, magazines, collectibles and miscellaneous other memorabilia for sale. We hope you’ll keep coming back to this site as new material will be added to all categories continually. We also have a section enabling you to order direct from us several of our books devoted to westerns. You may also subscribe to our print edition of WESTERN CLIPPINGS and purchase available back issues of WC and SERIAL REPORT. This “home page” will be devoted to news and information about upcoming western film festivals, western star obits, movie news and other immediate information that will be covered in more detail in subsequent print issues of WC. We hope you’ll put www.westernclippings.com into your “Favorites” and visit us often. © Entire contents of this website and all pages copyright by Boyd Magers 2008-2018. 4-22-19—Fay McKenzie, 101, leading lady in B-Westerns to Gene Autry, Buddy Roosevelt, Tom Keene, George O'Brien, Bob Baker and Ken Maynard, died peacefully in her sleep April 16 in L.A.
4-22-19—Nancy Gates, 93, leading lady to Lash LaRue, Eddie Dean, Joel McCrea, Jim Bannon, George Montgomery, Randolph Scott and others, died March 24. Seen in many TV Westerns also. 4-22-19—Teddi Sherman, 97, daughter of legendary producer Harry (Pop) Sherman, died last January 16 in Malibu, CA. Co-starred in Hopalong Cassidy's "Colt Comrades" then became a scripwriter on Joel McCrea's "Four Faces West" as well as other Western films and TV series. 3-25-19—Writer/director/producer Larry Cohen, 77, died March 23 in L.A. He created "Branded" for Chuck Connors and suggested the concept for "Custer" w/Wayne Maunder and wrote 14 episodes. Also wrote "Return of the 7". 3-17-19—Noted character actor Richard Erdman, 93, died March 16. Westerns include "San Francisco Story", "Rawhide Trail", "Saddle the Wind". 3-5-19—Legendary badman Morgan Woodward, 93, died February 22 on his Paso Robles, CA ranch. Besides 25 episodes of "Gunsmoke" and as a regular playing Shotgun Gibbs on "Wyatt Earp", he worked in virtually every other TV Western made.